We had breakfast at 'Shri Vinayaka canteen' (500 m from our lodge) and coffee at 'Hotel Mayur' (as we liked it very much the previous day :P) and left Chikkamagaluru at 9 am. Due to poor road condition and road expansion work, it took us 1 hour and 15 minutes to reach Halebidu. 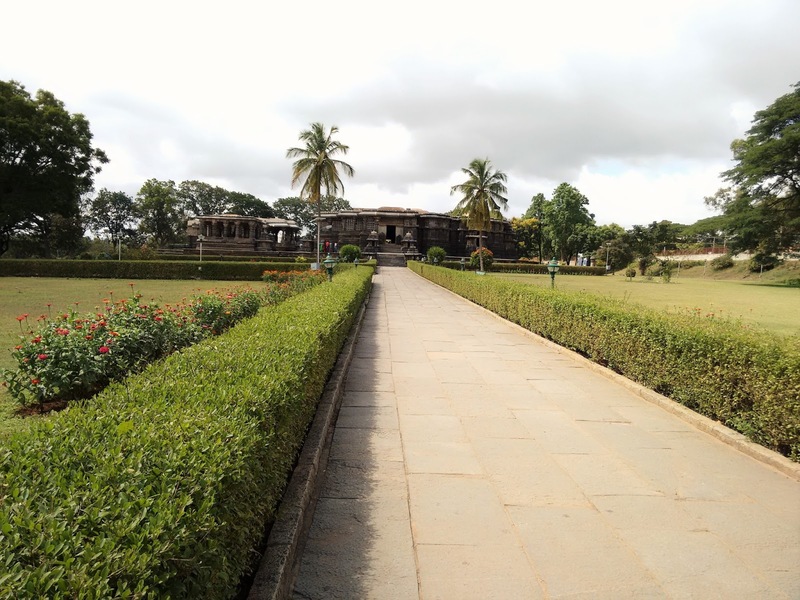 Halebidu is the capital of Hoysala’s earlier known as Dwarasamudra. After the battle against Delhi Sultans, the Hoysalas forced to relinquish their beautiful capital. 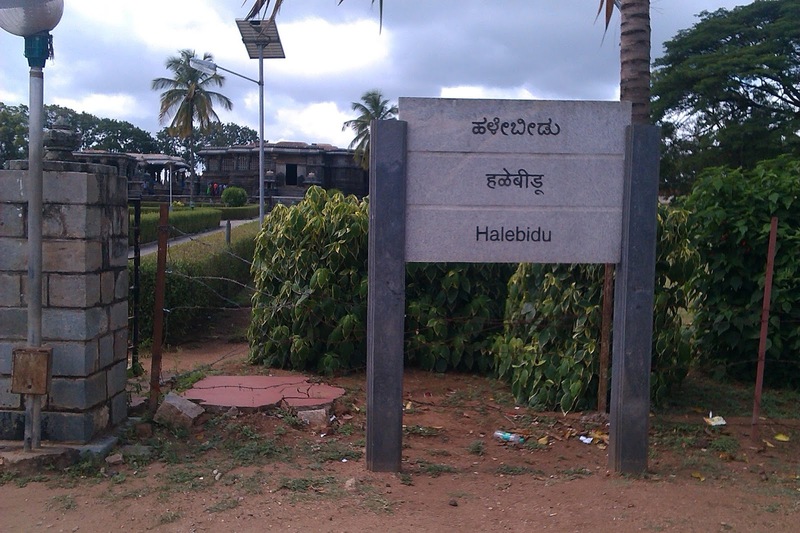 The town then nostalgically referred to as ‘Halebid’ or the ‘Old City’. The Hoysalas built over 150 temples in southern Karnataka out of which the temples at Halebidu, Belur and Somanathapura considered one among the finest and outstanding. This is the largest Hoysala temple dedicated to Lord Shiva. 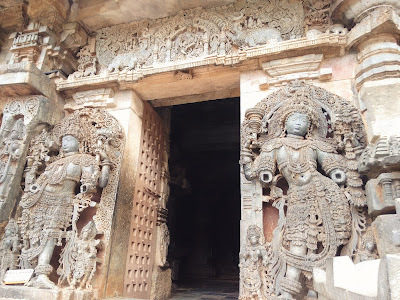 The temple complex consists of two identical temples namely Hoyaleswara and Shantaleswara named after King Vishnuvardhana Hoysala and his Queen Shantala Devi. Each temple has its own array of Navranga and Nandhi mandapas. Both the temples have a characteristic star shaped ground plan and are set on a stone platform as seen in other Hoysala temples. Monolithic Nandhi at Hoysaleswara temple being 7th largest Nandhi in India. Around the temple, you can see thousands of intricately carved sculptures depicting scenes from the mythological epics of Ramayana, Mahabharata, puranic legends, beasts and beauties on the walls. Temple guides are available here (fees - Rs. 250). 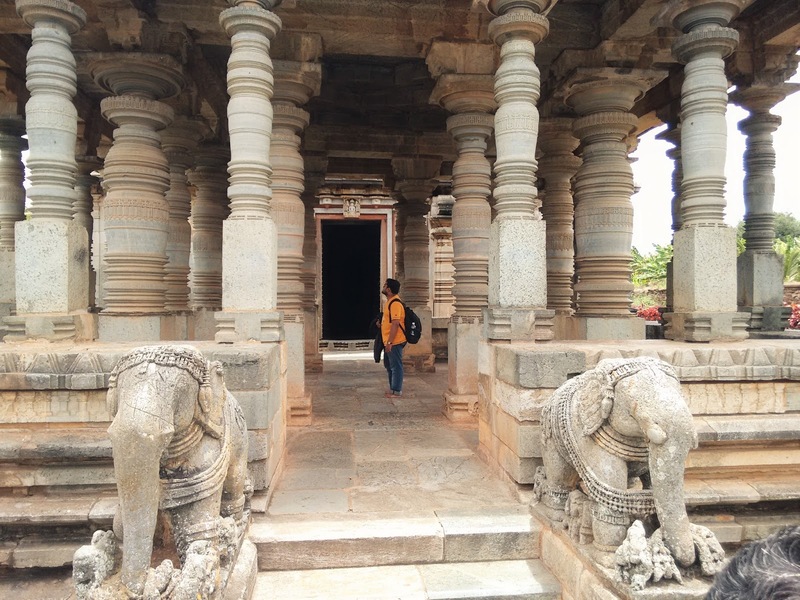 After getting to know about Belur (Day 1) we were more curious to know about history of Halebidu hence opted for guide here too. Our Guide - Mr. Dharmesh, co-incidentally started off with same question “neevu Beluru nodi bandra ?” (Did you people visit Beluru before coming here?) 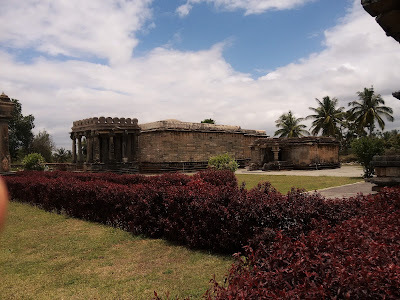 This time we could very much relate every bit as the history of Belur and Hoysalas were still fresh in our minds. Dharmesh began by explaining the 11 layers of carvings on the temple platform. ‘Samudra manthan’ or Churning of the Ocean of Milk. 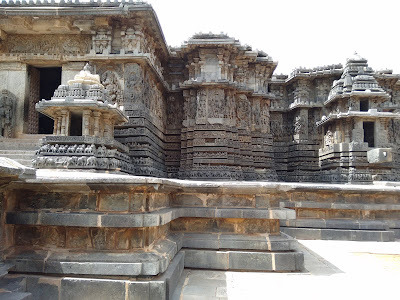 Typical star shaped architecture of Hoysala temples. 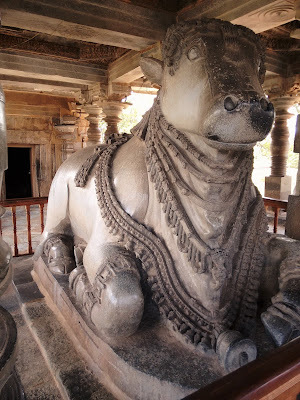 Monolithic Nandhi at Shanthaleshwara temple being 8th largest Nandhi in India. Carvings of Hale Kannada Lipi (language) on temple walls. Most of the statues here were damaged .Archaeologist tried to recover them but did not succeed. Main entrance for the king to enter the temple. On right is Lord Ganesha, Pooja would be first performed here. 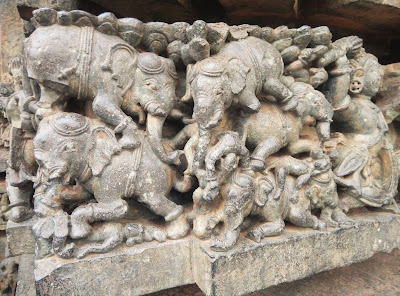 On left is the Hoysala’s emblem symbolizes of bravery. The imaginary animal ‘Makara’ on either side of Load Shiva. Lord Ganesha’s weight on his tiny vehicle ‘Mushika’ (Mouse) shown by carving its mouth open and legs slightly deeper in the ground. 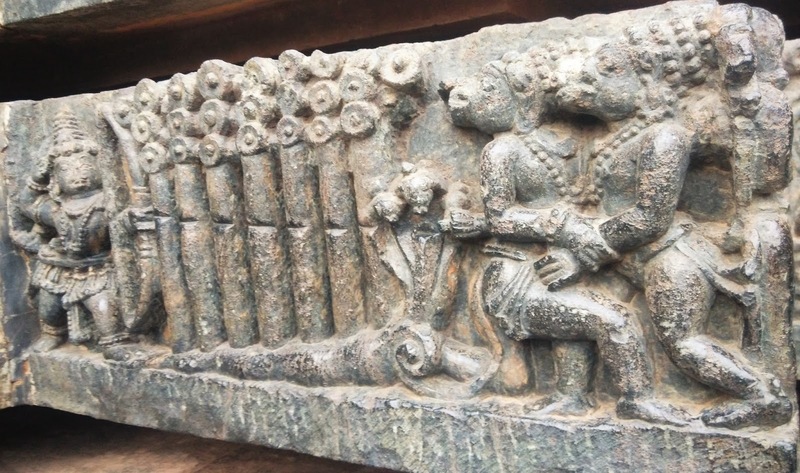 Lord Krishna carrying parvath, carved out of single stone. Lord Brahma, Lord Shiva and Lord Vishnu. Usually you will get see Brahma, Vishnu, Shiva in order together called as GOD – G for Generator (Brahma), O for Operator (Vishnu) and D for Destroyer (Shiva). Since this is Shiva’s temple, Lord Shiva is at the center. Lord Shiva dancing inside demon Gajasura’s (Gaja means elephant) stomach. Carvings show Arjuna’s arrows been multiplying in the battlefield. Dead elephants stacked one above the other in the battlefield. ‘Chakaravyuha’ from Mahabharata. Abhimanyu (son of Arjuna and Subhadra) had partial knowledge about Chakaravyuha, as he knew how to penetrate but did not know how to exit from it during the time of danger. Lord Rama killing of Vali from behind the tree. Ten headed Ravana carrying Kailash parvath. The carvings depict that he is trying to kill himself with sword as he could not bear the weight of the parvath. Lord Narasimha, fourth avathar of Lord Vishnu killing rakshasa (a evil person) Hiranyakashipu. There were lots more, Dharmesh took about one hour to explain Halebidu temple history and then asked to visit Archaeological museum within the temple premise to check protected sculptures. Next, we visited Kedareshwara temple and Basadi Halli (Jain temple) which is 0.5 km from this temple. This has beautiful star shaped structure having about 180 images of god and goddess set under ornate arches. There was no crowd here we just took couple of snaps and left for Basadi Halli (Jain temple). This temple is dedicated to Jain Trithankar, Lord Parswanatha swamy being most important. The temple is noted for its splendid sculptures and elaborate carvings. The twelve pillars in the navranga are so finely polished that you can see your image reflection in them. Around 1 pm we finished visiting these places, just for riding experience we headed towards Sakleshpur via Hassan. Near Byrapura (15kms from Hassan) it rained very heavily, so decided to stop of lunch. It was too late to go to Sakleshpur, so after lunch we simply took U-turn and headed back to Bangalore. Taking couple of tea breaks at toll booths we entered Bangalore at 8.30 pm. 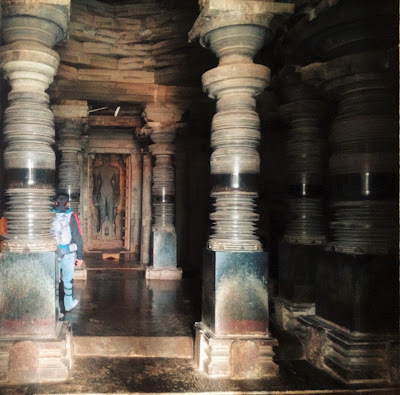 Chikkamagaluru – Halebidu – Hassan –Byrapura – Bangalore – Total 295 kms ride for 3rd day. - If you are visiting Chikkamagaluru between June to August then carry rain coats or else you will end up getting drenched like us :P.
- Spare clothes, water bottles, medical kit, mobile chargers and sunglasses. For bike trips- keep your luggage light, wear safety gears, helmet, jacket, follow lane discipline, do not over speed, take breaks whenever necessary and enjoy the ride. 1. 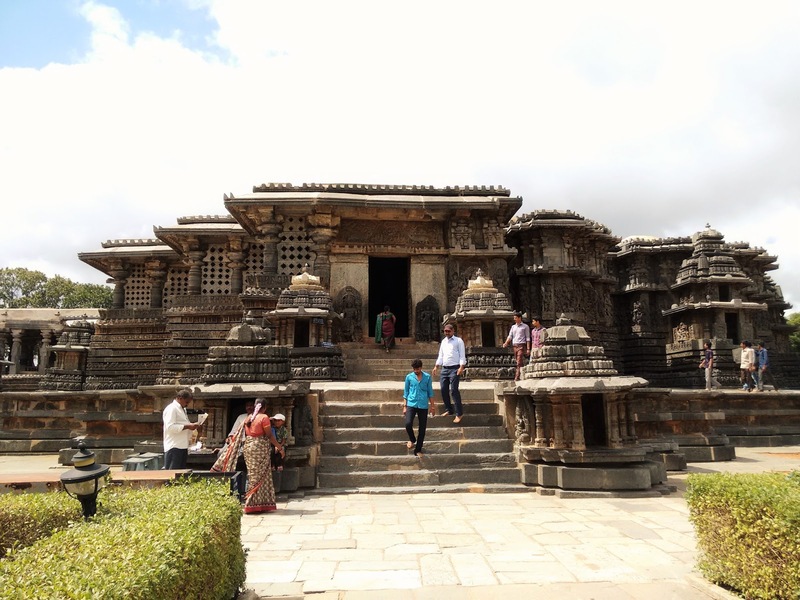 Temple guides Mr. Manjunath at Belur and Mr. Dharmesh at Halebidu for enlightening us with lot of information about Hoysala temples.